Takeaway: Very thorough and helpful commentary on Luke. I have greatly enjoyed my Luke reading project. Last year I read a suggestion by Jerry Bridges that instead of reading straight through the bible in traditional one year plan or some of our other formats, that we might benefit from more in depth study of scripture. Bridges suggested that if you spend six months on a book and really spend time in it you will have a very thorough knowledge of scripture in about 30 years. I am not sure I will keep this up for 30 years, and even if I do, it is likely that I would put together a couple of the smaller books as a single reading project. But I am declaring an end to Luke. 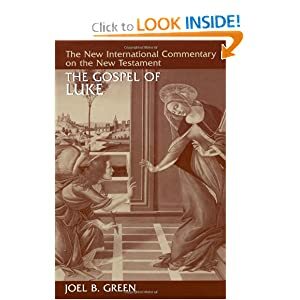 It has actually been closer to seven months and even though this commentary on Luke by Joel Green is very good and quite readable, I am still ready to move on. I chose to move on to the gospel of John next. That may be a bad move because I am going to read two gospels on top of one another, but the decision has already been made. I am going to finish up a book on the Holy Spirit that uses Luke and Acts, but otherwise, Luke is done. Below are the links to other Luke commentaries and books.